La Mason Arabe, a hotel located in medina of Marrakech, is the picture of elegance and indulgence. The hotel itself, a restored Moroccan riad, is built around two flower-filled patios and has 9 rooms and 8 suites, two restaurants, an impeccably blue swimming pool, luxury spa, and a cooking school. Using Moroccan materials and techniques handed down over the centuries gifted Moroccan craftsmen returned the old riad back to its original and spectacular form. The rooms in La Mason Arabe, many with fireplaces and private terraces, each have a unique layout and embody the exotic and colorful styles of Moroccan décor. With brightly colored bedspreads and pillows with intricate beading set against the stark white of the walls and the deep earthen ceilings make for an aesthetic view while the bathrooms, no two alike, are designed using Moroccan marble and granite. This small luxury hotel dating back to the 18th century is located at the heart of the medina in Marrakech and has been completely restored by world-renowned antique dealer Haj Mohamed. 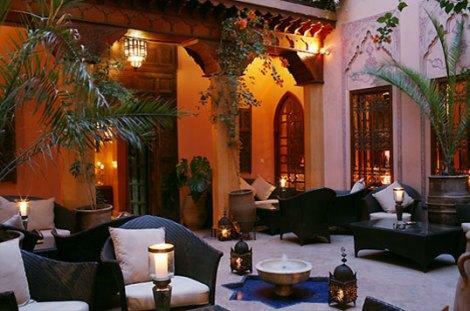 The Riad Kniza has eleven tastefully decorated rooms built around three courtyards with a view of the Moroccan sky. Each room has a satellite TV, air conditioning, and free WiFi connections. The restaurant at Riad Kniza, with only nine tables either in the restaurant or under the night sky on the roof terrace, offers a romantic and intimate atmosphere for diners who wish to taste the freshest of Moroccan cuisine. The hotel is conveniently located just a few minutes’ walk from the famous Jema L’Fna Square where visitors can explore the colorful souks, sample the sweet mint tea, and delight in the story tellers and snake charmers Jema L’Fna Square has to offer. Amanjena, meaning “peaceful paradise”, offers 32 spacious private pavilions, eight with private pools, and all with multi-faceted high domes, and wood-burning sunken fires to set the mood. Each terrace has a private pillared gazebo with cushions making it the perfect spot to sit and enjoy the Moroccan night. Surrounded by the lush greens of the olive grove and fruit trees, the snow-capped Atlas Mountains, and the buzzing activity of the medina of Marrakech the Amanjena offers the utmost in luxury and indulgence. Amanjena offers something for everyone, from fine Moroccan and international cuisine at their dinner restaurant, two clay tennis courts with an arched central pavilion for refreshments, a timber-floor gym for recreation, and a hammam for those looking for some rest and relaxation. The Kasbah Le Mirage is a hotel like no other. Located 4km from Marrakech facing the Palmeraie and the snow-capped Atlas Mountains the Kasbah Le Mirage sits at the heart of traditional mud-walled houses on the banks of the River Tensift. The last few meters to the hotel are traveled on foot on a dusty trail that leads guests to the vast reception hall on an ocre patio and luscious indoor gardens. Luxurious and unsurpassed hotel service, spa treatments, and fine dining is combined with outdoor activities such as quad-biking, archery, and horse riding to make the Kasbah a unique and fabulous experience. La Sultana Marrakech is located in the heart of the “golden triangle”, at the entrance of the city walls, next to the royal palaces, and right next to the famous Jema El Fna Square. La Sultana is a member of Small Luxury Hotels and Great Hotels of the World and lives up to its reputation with its 28 sophisticatedly decorated rooms and marble-filled bathrooms. Panoramic terraces complete with a misted solarium, bar, gazebo, and open air massage room only add to the elegance and indulgence of this 5 star hotel. With its flowered patios and blossoming orange trees La Sultana makes for the perfect romantic getaway. The drive up to the Sofitel is elegant enough, a palm tree lined driveway surrounding a magnificent fountain leads visitors up to the magnificent arched entrance. The 346 rooms and suites, each tastefully decorated in Moroccan décor, offer guests the ultimate luxury and comfort and a view of the Atlas Mountains, pool, or gardens. The spa at Sofitel offers guests the traditional black soap scrubs, body wraps, ghassoul clay, and Berber facial treatments. Those wishing to experience the Marrakech night life will be please to know that Sofitel boasts three bars and is in close proximity to a night club. With Sofitel’s luxury spa waiting for you upon your return don’t hesitate to dance the night away. Jnane Salmia is a luxurious privately owned villa located in Palmerie, a short drive from the center of Marrakech. The villa is perfect for a family, group of friends, or the rooms can be rented out individually. The main house is comprised of five stunning bedrooms, each with en-suite bathrooms and balconies overlooking the luscious gardens. The second house contains two bedrooms each with a bathroom, and sitting room with a common sitting room joining the two. Each house has its own private swimming pool allowing guests to soak up the Moroccan sun in the cool clear water. Meals are created for the guests exclusively by the resident chef whose cooking is a fusion of European and Moroccan cuisines. Visitors dine on exquisite meals in the luscious gardens of olive trees, rosemary, lavender, and jasmine that surround their villas. For the ultimate private escape visit Jnane Salmia, Marrakech. This luxury boutique hotel, located in the medina in Marrakech, was created from two riads which are connected by a bridge over a small alleyway. With just 11 rooms Dar Les Cigognes guarantees its visitors superb personal service in their Moroccan chic rooms complete with canopied beds and lavish bathrooms. Meals, snacks, and drink are provided for guests when and where they please, either in one of the many bhous, out in the courtyards, or under the Moroccan sky on the roof terrace. Local and fresh ingredients are used to make the finest in Mediterranean and Moroccan cuisine that is sure to excite and satisfy any taste bud. Ksar Char-Bagh is located just 6km from the medina in Marrakech and is situated in the heart of a palmgrove. With only 12 Harim suites and one apartment, each extravagantly decorated Ksar Char-Bagh offers superb and personalized service. The Harims, which means small apartment within a palace, are sensually decorated with low-lighting Moroccan lamps, intricately embroidered pillows, and deep marble baths. The hotel itself was inspired by 14th century Moorish architecture and running water, symbolising the rivers of paradise, run both inside and out. With a magnificent palm tree lined pool surrounded by luxurious lounge chairs, guests are invited to sit back, relax, and enjoy the Moroccan sun. This luxury resort and spa is based on the traditional Moroccan riad-style architecture but has added its own twist by using an 8-sided octogone shape for its buildings rather than the traditional 4-sided. This octogone theme is incorporated throughout the resort, from its 18 private 8-sided villas to its octogone hammam and 8-hand massage. The Terre spa incorporates a holistic and non-invasive approach to its rejuvinizing and restorative facials and massage therapies. The hammam itself is a peaceful oasis that allows guests a break from their chaotic routines and a chance to relax and cleanse with the traditional Moroccan steam bath. 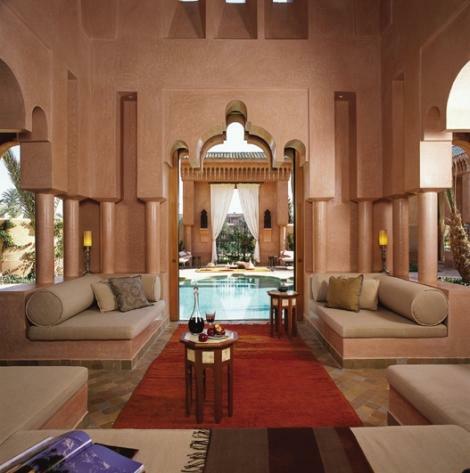 The ten hotels listed above are among Marrakech‘s most luxurious and elegent hotels. Each one steeped in the rich Moroccan history and culture they provide their guests with the perfect place to begin and end their Moroccan adventures.